Capitalism, Socialism and Democracy remains one of the greatest works of social theory written in the twentieth Century. Schumpeter's contention that the seeds of capitalism's decline were internal, and his equal and opposite hostility to centralist socialism have perplexed, engaged and infuriated readers since the book's first publication in 1943. 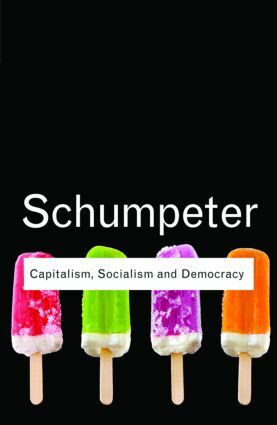 By refusing to become an advocate for either position, Schumpeter was able both to make his own great and original contribution and to clear the way for a more balanced consideration of the most important social movements of his and our time. Joseph A. Schumpeter (1883-1950). Originally born in Moravia in the present-day Czech Republic, Schumpeter was a renowned Economist, Business Theorist and Political Scientist. He has numbered among his pupils Robert Solow, the Nobel Laureate, and former chairman of the Federal Reserve Alan Greenspan.